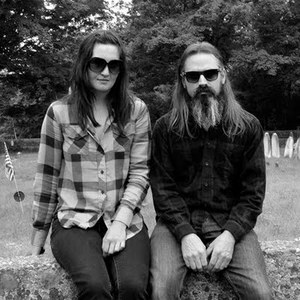 Moon Duo was formed by Ripley Johnson of Wooden Shjips and Sanae Yamada in San Francisco, California, United States in 2009. Inspired initially by the legendary duo of John Coltrane and Rashied Ali, Moon Duo counts such variant groups as Silver Apples, Royal Trux, Moolah, Suicide, and Cluster as touchstones. Utilizing primarily guitar, keyboards, and vocals, the Duo plays space against form to create a primeval sound experience. After a debut 12" single on Sick Thirst, the group released the acclaimed Killing Time EP on Sacred Bones, followed by the Escape LP on Woodsist. Inspired initially by the legendary duo of John Coltrane and Rashied Ali, Moon Duo counts such variant groups as Silver Apples, Royal Trux, Moolah, Suicide, and Cluster as touchstones. Utilizing primarily guitar, keyboards, and vocals, the Duo plays space against form to create a primeval sound experience. After a debut 12" single on Sick Thirst, the group released the acclaimed Killing Time EP on Sacred Bones, followed by the Escape LP on Woodsist. Their first proper LP, Mazes, was released on Sacred Bones and Souterrain Transmissions in 2011.